You don’t have to be Catholic to be a martyr. As I was researching the subject for this article I noticed that overwhelmingly the references were to Catholic priest and saints. Let me be clear from the start, you do not have to be Catholic to be a martyr. On the contrary, the definition of the word martyr comes from the (Greek: μάρτυς, mártys, “witness“; stem μάρτυρ-, mártyr-) someone who suffers persecution and death for witnessing to, advocating, renouncing, refusing to renounce, or refusing to advocate their Christian belief as demanded by an external party. This whole definition describes the simple Christian who has first-hand experience of God and becomes a fearless witness of His power and glory on His behalf. I have written in past articles of the true freedom that believers enjoy and that this freedom also includes the freedom of martyrdom, so well depicted in the image above. As witnesses of the Most-High God Christians are not to be reluctant or afraid to speak the truth of grace and wrath into the social, justice, and economic constructs of this world. If a Christian is to involve him or herself in the politics of this world it is only on this level that they are to participate. When they venture to endorse a person or party they are no longer a witness for Christ, who stands above all politics, but have chosen a “cause” other than the Gospel. It is this true freedom of the Christian to speak boldly in the face of rejection and persecution that has historically been the cause of martyrdom. It is precisely at that point of greatest conflict that the Christian is called to witness the truth of God in words that cannot be misunderstood. It must be remembered that the state, or the Church, holding power can and may refuse to discuss the issue. It can choose to be the singular voice of authority. It may elect to destroy that which confronts it. This may be the price of direct confrontation and open conflict. This too is historically shown to be a viable option of those in power. Even though this option does not look obvious at this hour we must remember and be prepared as witnesses to offer the ultimate sacrifice; we have that freedom. It must be remembered also that it was the Church in league with the state, at the crucifixion of Christ, during the time of Constantine, and during the Reformation that was responsible for so much death of believers, and it will be the same in future days when true believers will be eliminated by the Church in league with the state. Need it be recalled that the past records of the great witnesses of the faith, as martyrs who acted in true freedom and liberty of conscience, who ruled out revolution, self-defense, and military honors, refused to kill any man? 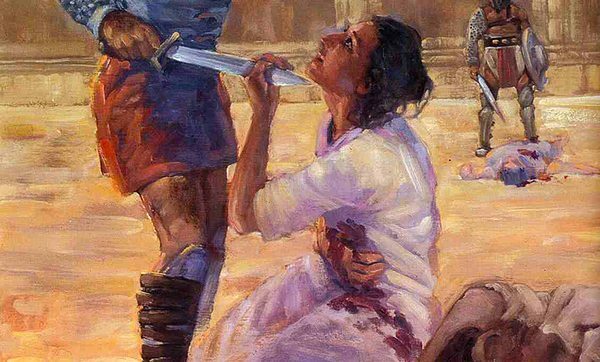 They understood the enemy as that neighbor which they were called to love even though he holds the sword to his neck. To be called as a witness is not a resignation to some passive activity. To be a martyr is to affirm the sovereignty of our Lord. Today we hear no talk like this because martyrdom is a word Christians fear. The style of conversation has changed and you hear instead much talk of politics, violence, and hatred. They justify their hatred by balancing it with love for the oppressed and the stricken. It is not on this basis that the powers can be critiqued or assessed because here they are in much agreement with both feet in the world. To be a witness in the world it must be a deliberate act of speaking truth into the commercial Church and the state, and along with that truth, there comes an undeniable claim to persecution and martyrdom. 2 Tim 3:12, 1 pet. 4:12-14, Mat. 5:44, 5:10, Lk. 6:22, Jn. 15:20, etc. The persecution and crushing of the Body of Christ call the powers-that-be into question no less so than open dialogue. Once the Body bleeds then roots come forth. Even though it may appear to be impotent and weak the powers are shaken and stunned and their own weakness and inadequacy exposed. The only thing that can stop the Body of Christ is unfaithfulness to the words of the Lord; the replacing of His voice with the echoing voices of men competing for power in buildings of brick and mortar. The voices of men have allowed the enemy to instill fear in the place of faith and trust. They have ceased listening to the Words of the Lord and have instead found a basis in the world and by so doing have become part of the world even though they use many God words well.